Religious Themes in Art – A Challenge or an opportunity? What are the key issues in the development and presentation of art outside the mainstream? 2006 – LEDGE space, Mediarts, Waikato Institute of Technology. PA’UMEME’E IS A VERY ODD WORD. 2006 –SOFA (School of Fine Arts Gallery, Ilam, Canterbury University, Christchurch – part of the Ono Pacific Festival from 23rd Jan – 5th February – exhibiting : Ich Heisse Olga Hedwig Krause, Deutsche Kuenstlerin. 2005 – Ich Heisse Olga Hedwig Krause, Deutsche Kuenstlerin – Burke Museum, Seattle, Washington, USA. 2004 – TRANSLATION: Gallery Sleepover – Ramp Gallery, Hamilton - One Week Installation. 1998 – EXCERPTS & PROCLAMATIONS – Artspost, Margot Philips Gallery, Hamilton. 2009 – Toast: Photographic installation –, Banana on Toast – organized by Kate Muggeridge and Zena Elliott. 2009 - OFF STAGE 1 – Galatos Theatre, auckland, nz. performative art piece with Popo Wilson. 2005 – PLANETARITY – Committee member for an PLANETARITY, a project involving artists around the world – cultural theory, activism and art. 2005 – Tautai Group Show – Auckland Art Fair 2005, Methodist Church Hall, Pitt Street, Auckland. 2005 – Bookmark – Ramp Gallery, SPARK 05 conference, Media Arts, Wintec, Hamilton. August 2005. 2005 – Duets – Duet sculpture with Nicky Deeley, Other artists included, Yuk King Tan, Lisa Benson, Fiona Amundsen, Cassandra Bennett, Grant Matheson, Matt Ellwood, Lauren Winstone, Nick Spratt Rm103, Auckland. 2005 – Assemblage – Platform01, curated by Sarah Kernohan Grey Street, Hamilton. 2005 – Uhuruna Unijoa Maendeleo,Freedom,Unity, Development, fundraiser for the Hisani Centre for Women and Children, Tanzania, curated by Samarah Wilson and Teuila Fatupaito – Victoria Street vacant building, Hamilton. 2004 – The Little Things/Nga mea iti – Waikato Museum Staff Show. 2004 – Planetarity Project with Curator Raj deep Singh, Vancouver Art Gallery, Canada. CD art compilation for worldwide distribution in 2005. Artists, critics, curators and writers from around the globe submit work, challenging Euro centricity in art discourse and practice. 2004 – Unseen City – Media Arts, Waikato Institute of Technology, Hamilton. October 2004. Curated by Janice Abo Ganis. 2004 – Duets: The abandoned sculpture project. RAMP Gallery,Waikato Institute of Technology, Hamilton. . Curated by Lauren Winstone. Other artists: Eve Armstrong, Andrew Barber, Kaleb Bennett, Lisa Benson, Kah Bee Chow, mark curtis, Natalie Davies, Nicky Deeley, Kirsten Dryburgh, Matt Ellwood, Vaughn Gunson, Jo Langford, Richard Maloy, Victoria Munro, Douglas Rex Kelaher, Stuart Shepherd, Sriwhana Spong, Nick Spratt. 2004 – Calder and Lawson Gallery, Wel Performing Arts Academy, University of Waikato, Hamilton. Natalie Robertson, Don Ratana and myself – Indigenous Performing Arts Festival PAO PAO PAO 04.Curated By Conal McCarthy. 2004 – Pasifika Festival 04, Western Springs, Auckland. In conjunction with Tautai Contemporary Arts Trust, STALL/ DISCOUNT PERFORMANCE – interactive performance art. Organised by Itania Nikolao. 2002 – Pataka Museum of Arts and Cultures, Porirua, Wellington. Dolly Mix (W)rapper. 2nd venue. 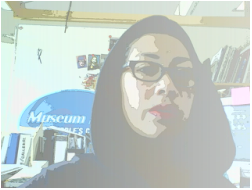 2002 – Waikato Museum of Art & History – Te Whare Taonga o Waikato, Dolly Mix (W) rapper, Contemporary Women Artists of Samoan Descent – also featuring Lurlene Christiansen, Lorene Taurerewa, Sr Marie Angela – Samoa, Momoe Malietoa von Reiche – Samoa, Lily Laita, Itania Nikolao, Uputo Ali’fa’alogo, Wilma van Heeswijk, Niki Hastings-McFall, Lonnie Hutchinson, Janet Tristram, Sia Figiel – Writer, Rosanna Raymond - London, UK, Celva Togia, Eimi Tamua, Sima Urale –filmmaker, Erolia Ifopo, Shigeyuki Kihara and Lindah Le Pou, Sara and Bonni Tamati- Graff Artists (site specific work),Lole Usoali’I – Singer and Sheelahroc ( Karoline Tamati aka Ladisixetc) and catalogue co-written by Jakki Leota Ete – Pacific Curator and Jim Vivieaere. 2002 – Waikato Museum of Art & History – Te Whare Taonga o Waikato Hamilton, Sublime Indigo – Group show of Contemporary and Traditional Artist based around the ancient colour and art of Indigo dying. With Ani O,Neill, Mladen Biszumic, Yuk King Tan and Traditional Indigo Practitioners. 2008 – Trees at the Meteor – Judge and 3D designer for large Christmas Tree Art Competition hosted by Incedo. 2008 – Judging Panel – Matariki Wearable Arts – Collaboration with Wintec, Hamilton. Other judges: Donna Campbell – artist/ lecturer University of Waikato, Hamilton, Anna Carter – PR Manager for Wintec, Hamilton. 2008 – Scope Magazine – Wintec Pulbication – casual feature writer: The Interns. 2006 – Korean language Catalogue for Dr Huh Dong Hwa – The Art of Dr Huh Dong Hwa. 2005 – Letters to the Ancestors Catalogue – Waikato Museum – Curator’s catalogue essay. 2003 – Catalogue - A Forest of Many Flowers, VSA & Tautai Contemporary Arts Trust show @ Auckland Town Hall, Auckland New Zealand. 2003 – Catalogue – 20/20 Sight Spacific, Centre of Contemporary Art, Christchurch New Zealand. Dr Huh Dong Hwa & Dr Park – Seoul, South Korea.